Appearing through the company's refurbished section of the online Apple Store, the iPhone X is being offered as an unlocked device, having passed through Apple's process. Models are offered packed in a brand new white box, a new battery and outer shell, and a one-year warranty, the same as a brand new iPhone. According to the store's pricing, the 64-gigabyte model is being sold for $769, effectively $230 off the original sale price for the model at launch, while the 256-gigabyte capacity variant is on sale for $899, itself a savings of $230 from the $1,149 launch price. Both models are also offered in Space Gray and Silver variants. The appearance in the refurbished store is a first for the model, which was replaced by the iPhone XS and iPhone XS Max last fall. It has also been a very brief appearance in the store as well, as at the time of publication there are no longer any more units available of the iPhone X. While the deal is attractive to some users, it is notable that the refurbished iPhone X is being offered at a higher price than the current-generation iPhone XR, which has a larger LCD display instead of OLED, a faster processor and a single camera on the rear. The iPhone X does offer dual cameras on the rear as well as an OLED display, which offers a better picture quality than the similarly-priced and newer model. For comparison, the lowest-capacity iPhone XR model at 64 gigabytes sells for $749, $20 less than the pre-owned iPhone X. For the 256-gigabyte capacity model, the iPhone XR costs $899, the same as the used iPhone X following Apple's refurbishment. Those looking for the lowest price on the iPhone X can find even more aggressive deals at third-party resellers. Gazelle currently has a variety of models available from $669 with a Gazelle Certified Guarantee. This means the devices have passed a 30-point inspection for added peace of mind. 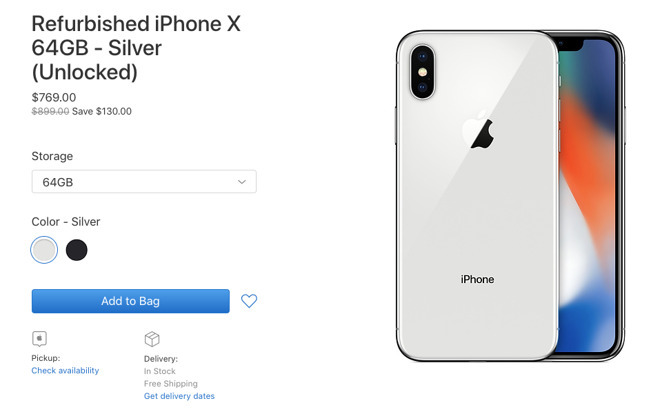 Walmart Marketplace sellers also have iPhone X devices on sale, with locked and unlocked options available from $605.